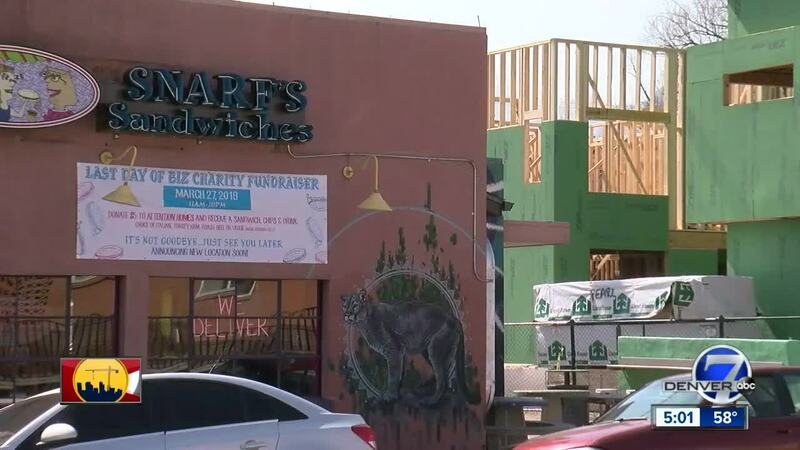 Snarf&#39;s Sandwiches will close this week to make way for a new housing development. BOULDER, Colo. — In every city, there are a few restaurants that embody the heart of an entire community. These local delights show the true character of the city. For Pearl Street in Boulder, Snarf’s Sandwiches is one of those restaurants. Just ask any local. “Snarf’s is Boulder,” said Rick Statz. Statz has been coming to the shop for more than 25 years and every time, he orders the same sandwich. “If something is good, I don’t change it at all,” he said. Some restaurants have a secret recipe that makes their food stand out from the rest. For Snarf’s, the unique taste isn’t really a secret at all; it’s sold in jars right on the counter where patrons order. “Some people don’t get the peppers. You’ve got to get the peppers because the peppers are Snarf’s,” Statz said. Whatever the reason is that people continue to come here, Snarf’s has seen quite a bit of success. The restaurant now has 20 locations spread out through several states, including four in Boulder. Owner Jimmy Seidel has even started branching out away from sandwiches, opening Snarfburger in 2013. But even with all that success, this week, for the second time in a little more than a decade, the Pearl Street location of Snarf’s Sandwiches is closing down. The restaurant is making way for new condominiums to be built. “It’s definitely a sign of what’s making money here, I think, especially in this downtown area. They want more condos right now and not so much more sandwich shops,” said Pearl Street Snarf’s General Manager Bobby Cendali. The Pearl Street location is considered the flagship store for Snarf’s but it is not the original location. The first Snarf’s, lovingly dubbed The Shack, was located just a couple of blocks down Pearl Street. It too was demolished to make way for housing. “You’ve got condos going up all the time, but Pearl Street will always be Pearl Street,” Cendali said. The location will eventually be turned into 17 townhomes called Pearl21 . The real estate broker for the property, John McElveen, says the townhomes are already starting to be constructed next door to Snarfs. The townhomes are between 1,500 and 2,000 square feet and will run for between $1.3 to $1.7 million. The first 10 have already been sold and are expected to be completed in November. The second phase of the project has a target completion date of January 2020. The construction project is just the latest sign of a changing and growing city. “It’s a supply-constrained market because of no growth or slow growth," McElveen said. Boulder, like Denver, is experiencing some growing pains. Not only is the price of property going up, but McElveen said things like historical preservation of older areas, growth restrictions and even height restrictions are making it difficult for the Boulder housing market to expand. On Pearl Street, buildings are not allowed to be taller than 35 feet. In the downtown area, the height restriction is closer to 55 feet. “We can’t build up and we can barely build out,” McElveen said. The condos coming to Pearl Street are just the latest addition to a market that is struggling to keep up with demand. But with all of this new development, cities like Boulder are struggling to find a way to keep some of the original character and charm while embracing the growth. “It’s kind of hard for the little guy to find somewhere,” Cendali said. The owner of Snarf’s is still looking for a new home to his flagship location. In the meantime, employees will be spread out to the other locations so that they don’t lose their jobs. “We’re going to find a place that isn’t going to get torn down to build more condos. We’re going to find a permanent spot,” Cendali said. Snarf’s last day open at this location is Wednesday. The restaurant is hosting a charity fundraiser that day with all of the proceeds going to Attention House, which helps homeless and at-risk teenagers. The building itself will be demolished on April 1.